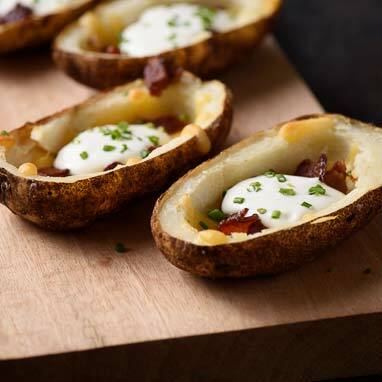 Hot, crispy, and flavorful, Loaded Potato Skins don't require you to cram into a crowded sports bar for the next Big Game. These easy and delicious snacks are the perfect finger food. The best thing about them is that they can be prepared the night before—just pop them in a hot oven for a few minutes before you're ready to serve them.